I had planned to write about other things this week. 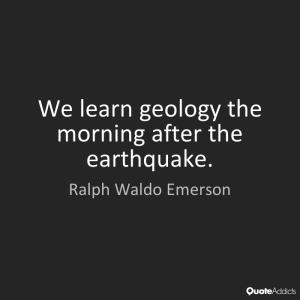 But given the earthquakes in NZ recently seismic activity is on my mind! I have had a long standing interest in the way the earth works - the fluids that flow within and on its crust, and the forces that conspire to shape and continuously remodel the earth's structure. This interest may go all the way back my birth since the earth shook as I was preparing to make my entrance into the world. Four hours before I was born the hospital my mother was in rocked with a 6.6 magnitude earthquake (with an epicentre close to Owhango). A 3.95 magnitude quake happened just as I was delivered. Fast forward several decades ... and the research my graduate students and I undertake applies a range of mathematical and computational tools to understand the earth. Micro-seismic activity is one data set of interest. 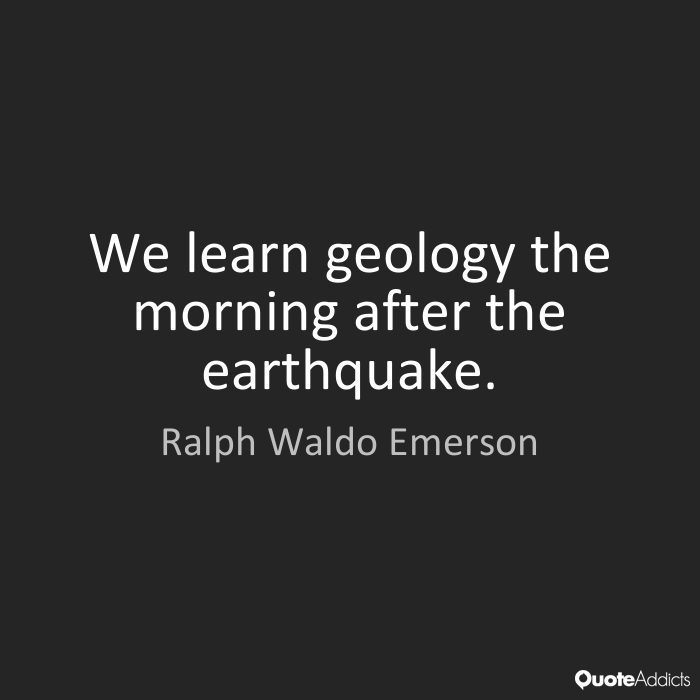 Micro-seismic events generally have magnitude less than 2. The Richter scale is a logarithmic one, so a magnitude 3 quake is 10 times larger than a 2, a magnitude 4 is 100 times larger than 2, ... and a magnitude 7 is 100,000 times larger than a 2. Such quakes are imperceptible by humans and need sensitive geophysical equipment deployed in boreholes to detected. However there are large numbers of these very small events which can make them a rich data set to explore. One of my PhD students, Jongchan Kim, is working with micro-seismic data from a portion of the Wairakei geothermal field. He's integrating it into a model that addresses fluid flow, heat flow and changes in mechanical stress in the field. The micro-seismic data gives us insight into the permeability of the rocks involved, and the faults that exist in the reservoir. Another PhD student, Jeremy Riffault (working wtih David Dempsey and I) is building numerical modelling approaches to help understand the micro-earthquakes which may occur during the development of enhanced geothermal systems. Our shaky isles have some significant faults (geologically speaking!). 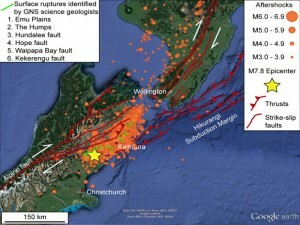 The recent quake activity shown below is challenging infrastructure, and has sadly caused fatalities. 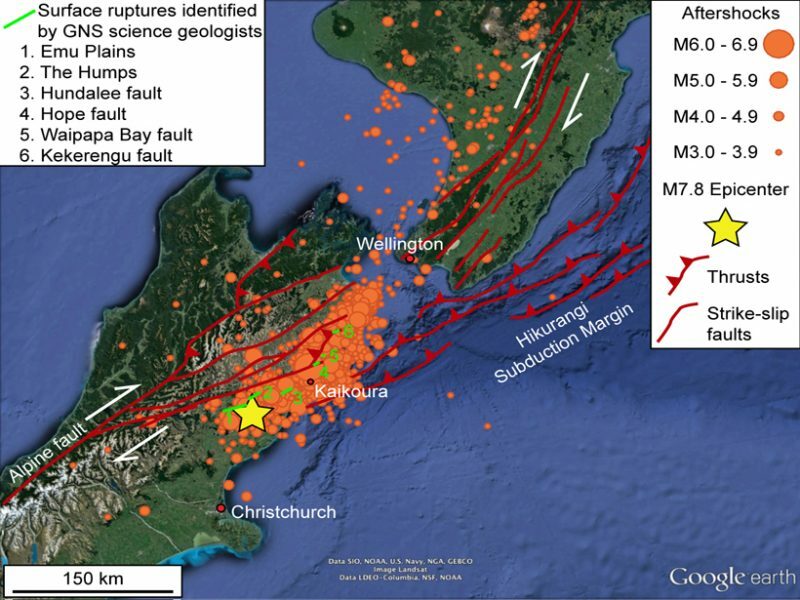 However further north faults form an important component of the Taupo Volcanic Zone which provides the geological setting for most of the country's geothermal energy production. That clean energy source produces around 16% of electricity per year. So our faulted geology has its upsides! Posted in Uncategorized and tagged David Dempsey, earthquakes, Jeremy Riffault, Jongchan Kim on November 21, 2016 by rarc002.